St. Dunstan, Archbishop of Canterbury (+988). Acrylic and gold leaf on panel, 8"x10," private commission. I love Saint Dunstan and consider him an unofficial patron of my life. 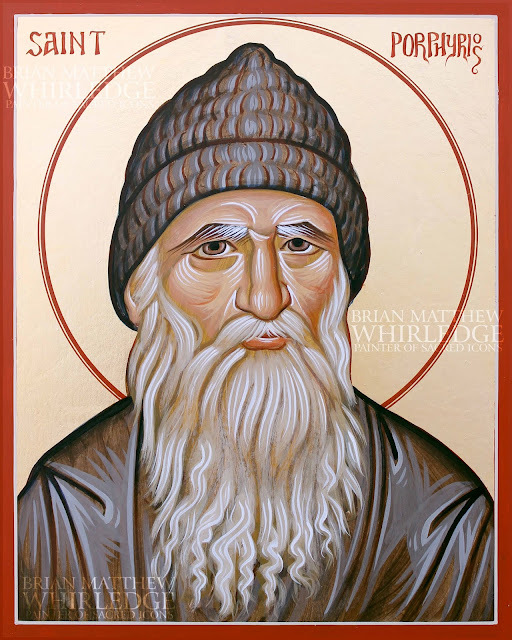 I was born on his feast day, May 19 and have really felt his influence in my life. I feel very close to him in many ways; we are both English by blood and ecclesiastical artists and musicians. He lived from 909 to 988 and was the definition of a polymath: he was a talented artist, musician, clergyman, and statesman. I did quite extensive research for this icon. He is wearing X century English archepiscopal vestments. English bishops did not wear mitres until XII century. He wears the pallium (as an archbishop), as well as chasuble, dalmatic, alb, maniple and amice. As a bishop, he holds his crosier facing outward, shepherding his flock, as well as holding the Holy Gospel as a teacher. As an artist, he is holding smithing tongs and hammer, a quill and brush, and a harp. There is a story that St. Dunstan pinched the devil's nose with red-hot tongs when he tried to tempt the saint as he was smithing a chalice. 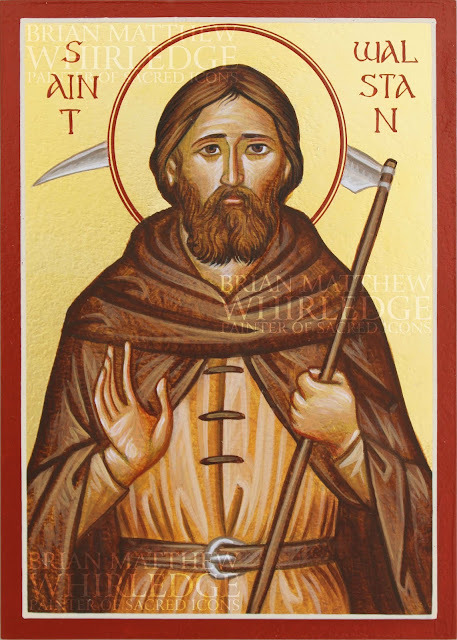 St. Dunstan was from Glastonbury (home of the Glastonbury Thorn, which grew from the staff of St. Joseph of Arimathea when he planted staff in the ground when he evangelized England after the Resurrection of Christ). He was a monk, abbot, and bishop, eventually becoming the Archbishop of Canterbury. St. Dunstan led a cultural and monastic revival in tenth century England, which had been ravaged by the vikings. He established many monasteries. He encouraged the arts; Glastonbury became a center of culture. 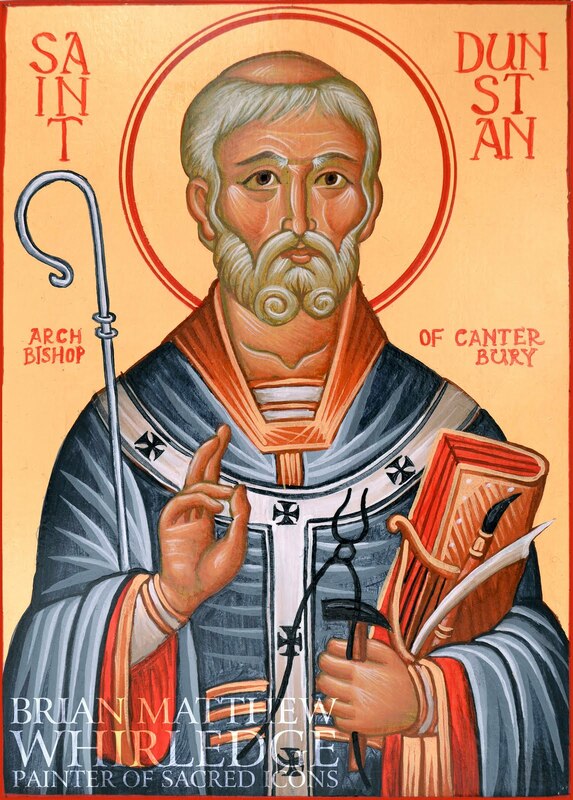 St. Dunstan became Archbishop of Canterbury, and advised kings (of whom was St. Edward the King-Martyr). As a visual artist, St. Dunstan was an icon painter, he illuminated manuscripts, designed vestments, cast bells, was a goldsmith and made holy vessels from precious metals (such as chalices and censers). Below is a manuscript which St. Dunstan illuminated, and contains a self portrait of the humble Dunstan prostrate at the feet of the mighty Christ. As a musician, St. Dunstan composed hymns for the Church. He played on a harp to accompany the nuns of his abbey as they worked. His dying words were sung from the Psalms of David. One surviving hymn is "Kyrie Rex Splendens," which Saint Dunstan, in a vision during Mass, heard the angels in heaven singing. He quickly wrote it down to preserve it. It is sung below. By thee, O Dunstan, hath the whole land of England been wondrously adorned, for thou didst labor unceasingly to restore all the monastic houses laid waste by the heathen, to people them again with zealous monks and nuns, and to provide them with strict rules of pious order wherewith to govern their lives. Wherefore, the Church of Christ doth ever praise thine all-honorable name, O holy bishop. 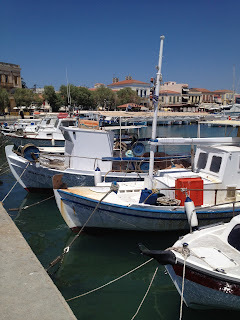 Like a master helmsman, O Dunstan, thou didst ably pilot the ship of Church and state in England, skillfully avoiding the treacherous rocks and reefs hidden beneath the tides of thy times, and bringing it safely to the calm harbour of heaven, fully laden with its freight of men's souls, which thou didst deliver, rejoicing, to Christ thy Master. Daniels, R. W. (1987). Dunstan, jewel of the English. Tulsa, OK: St. Dunstan's Press. Norris, Herbert (2002). Church Vestments: Their Origin and Development. Dover Publications. 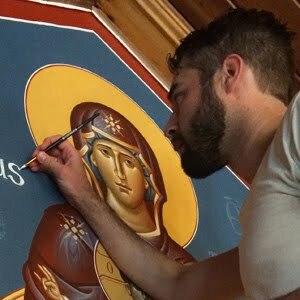 Buy mounted prints of my icons from the Damascene Gallery.